28 year old Christina McCarthy has just received a permanent work contract and is as happy as any other person in the workplace. However, perhaps her happiness is more acute given that her work trajectory has not been plain sailing. Christina has been blind from birth and employment amongst people with sight loss remains stubbornly low with just some 26% of people with sight loss in employment. A bright and hugely engaging young woman, who studied French and Spanish in Trinity, she smiles when she agrees that she has grit and determination in spades, necessary qualities when it seems the odds are stacked against you. “When I finished my degree I got work immediately but it didn’t last”. This led to a period of unemployment which spanned some two years. Not one to rest on her laurels however, Christina went back to College, this time studying for a Diploma in PR and Communications. She said that all the while she remained active and determined that she would procure work when her course finished. “I went to a talk organised by Enterprise, the global car hire company”. “I applied for a job with them, got an interview and eventually got the job! It was a process that lasted over 6 months as the company had to adapt its software to make it accessible for me, and this they did perfectly and so professionally. They got the maximum grant from the Department of Social Protection to allow them to do this”. With the groundwork done, it just remained for Christina to get in there and get to work which she did with gusto. “I just couldn’t wait, I had no qualms or nerves, just a desire to be the same as everybody else, a member of the workforce, getting up every morning, on the bus and out to work”. A year on, she says she couldn’t be happier. “I am working in customer service, accounts receivable and translations. Given the business I am in, my language skills are put to good use which is great. I can do everything, the same as anybody else and really Enterprise has ensured that I can be the same as anybody else. While they have supported me to the hilt, as they do with all their employees, they expect the exact same from me as any of their other employees and this to me is crucially important. I don’t want special treatment, just a fair chance . While my eyes mightn’t work, my brain certainly does!”. She admits that she is often frustrated at the lack of understanding of what visually impaired people can bring to the workplace, saying that the massive advances in technology have allowed and are allowing them to do virtually everything that the sighted community can do. “OK we can’t drive but hey, we can do most other things”. Christina is passionate about the need to inform potential employers about hiring people with sight loss. “I don’t believe that employers are deliberately excluding us, not at all, it is more that they don’t know what they can do to include us. When I was in College I hadn’t a clue about what supports were there to make my entrée into the workplace, so more has to be done in this area. If I didn’t know, what hope is there for would be employers. They need to be informed and I truly believe once they have the information and know the grants and supports available to them, they will open their doors to workers with sight loss. Any good business person will want to get the best staff they can and it shouldn’t matter if that person has sight loss, once they can do the job”. 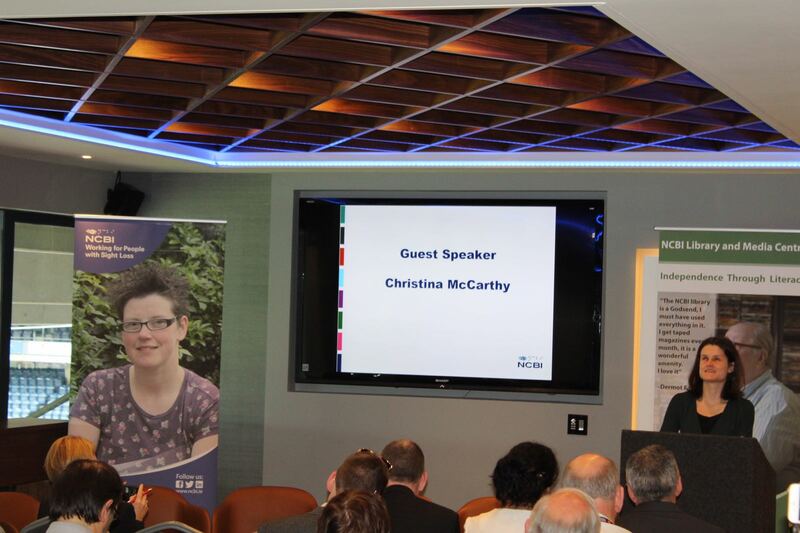 “The NCBI is a huge resource and I would urge the business community to reach out to them and learn from them. They are a mine of information”. Christina is getting married next year and says her new found employment status means everything to her. “We’re getting married so I need my job, weddings aren’t cheap! Of course it is not just the money that work brings, it’s the sense of purpose, sense of achievement and being involved. Now I have control over my life and my choices and you can’t buy that”. Denis Daly, Employment Advisor with the NCBI says there are lots of supports available for potential employers. “NCBI is the natural point of contact for employers who want to hire people with visual impairments. We offer a full range of services including advice on available grants, assistive technology and disability training awareness. We assist people with varying levels of sight loss to retain their existing employment or retrain for new opportunities. We work with training institutions and Government services and liaise with HR, line managers and supervisors. Our Library and Media Centre converts written material and text books into Braille and audio formats so there is a whole depth to the help and support NCBI provides. It is often a surprise to employers that people with visual impairments can be so employable and with the advent of, and huge strides in assistive technology, their employability can only improve”.